The film was boring, moving at a snail’s pace, and devoid of the kind of crazy scandals of excess or intrigue that make art documentaries interesting. Legendary artist Gerhard Richter, while gracious and polite enough, was a reluctant subject for scrutiny. There were no salient revelations about the meaning of life. Even the most mundane and pedestrian personal details necessary to flesh out the basics of biography were missing in action. Still less was said about the history or importance of the artist’s vast and varied body of work. But that said, there was something inexplicably compelling and charming about the documentary. I went in expecting to learn a great deal more about Richter and his ideas about art. This curiousity went unfulfilled, however, yet what happened in this understated gem was more important and more rare- the audience became witness to process. There were no lofty discussions and dissections pitting art world elites over clamouring hopefuls. There were no hard-to-swallow claims about why a few accidental splotches were measures of genius or how muddy canvases demonstrated masterful strokes and composition. Instead, Richter freely confessed the joy of arbitrary application. He copped to the fact that “finished” was subjective, purely dependant on whether he liked the random results. Far from planning the placement of every drip and saturating it with supposed symbolism, he admitted the art works did what they wanted. The film touched on Richter’s work in different media, including astonishingly realist paintings. 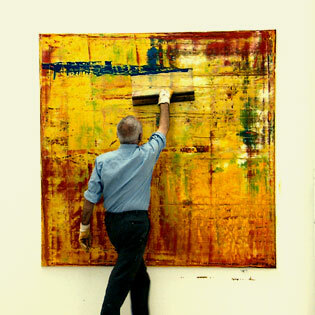 But the appeal the film had was to be found in watching Richter work on his abstracts. Viewing this process made us itchy to get our hands wet and hair dirty, to view painting as an action verb. We painted vicariously through the artist, immersed fully in the plasticity and tactile sensory experience of wet paint. Witnessing the sounds of the brushes and squeegees, the hesitations between applications, the transformation of texture, was extremely liberating. I am most certainly not the only one who rushed to my studio after the movie to play until the wee hours of the morning. Lorette C. Luzajic’s website Idea Fountain.